This past summer we went to Rita's for the first time, and found out that our son can have ices from there. It only took us three years to find out, and wish we had known sooner. 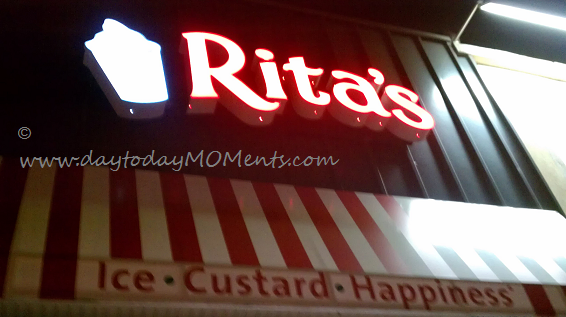 Good thing our son is still three years old and can enjoy Rita's from now on. The joy I feel to be able to have my little boy choose which flavor or color he wants, is just amazing. It's the only place he can have a cold treat from that we know of, and can not be any more thankful. We have frequented there so many times since our first time this past summer. They have an allergen chart where you can see all the flavors that have major allergens. My son has come to love the pear, apple, and cotton candy flavors. They offer different flavors that are freshly made daily. You can sign up for special coupons or deals by joining their online birthday club as well. I grew up eating ice cream, and am a huge fan so to be able to enjoy a frozen treat with my son on the go is incredible to us. We do have other options like buying a pint of ice cream and bringing it home, but to be able to eat from a little shop is awesome. So if you have food allergies, or know someone who does, check out Rita's! It changed our evening drives, and gave us a treat after the movies. We usually go to the one in Yonkers, New York, find your nearest location here.